Recreational Boating Market size is estimated to surpass USD 230 billion by 2024; according to a new research report by Global Market Insights, Inc.
Travel and tourism activities have witnessed an upsurge across the globe owing to increased disposable income, majorly contributing to the industry revenue generation over the forecast timeframe. These boats are increasingly being used in various leisure activities such as motorized water sports, campaigning, sailing, and boat racing. This has resulted in increased production, further propelling the recreational boating market share from 2017 to 2024. Continuous improvement in economic conditions, specifically in developing countries has led to increased expenditure on fun & leisure activities. High preference of consumers owing to provision of the benefits such as incorporation of high-end and advanced features in these boats, will positively influence the industry growth. Furthermore, continuously ageing boat fleet is likely to instigate the demand for advanced outboard engine boats, further strengthening the product penetration. However, lack of financial access coupled with export barriers owing to high tariffs, will pose a threat to recreational boating market participants over the next eight years. 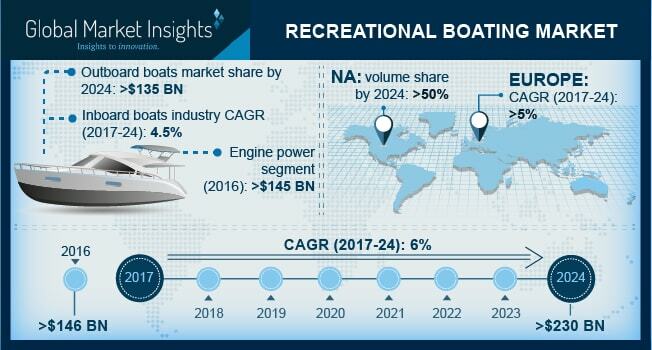 Engine-powered recreational boats were valued at over USD 145 billion in 2016 and will continue its dominance in recreational boating market till 2024. Developed countries such as U.S., Japan, and Russia are witnessing high demand for power engine boats, further contributing significantly towards the revenue contribution. Man-powered boats will exhibit around 4% CAGR from 2017 to 2024 owing to their cost-effectiveness along with increasing demand for fun and leisure activities including river rafting and water sports. Industry players focus on integrating several marine technologies in these boats. Emerging trends such as global navigation satellite system (GNSS) are gaining traction among the manufacturers. These systems are highly beneficial for both direct and indirect users of these boats. They are primarily used for traffic management and overall surveillance in the waterways. Various other benefits such as fishing vessel control and search & rescue are responsible for high preference of the manufacturers. Incorporation of these advanced features will offer stable growth prospects for the recreational boating market till 2024. Outboard boats are anticipated to showcase dominance in the recreational boating market, accounting for more than USD 135 billion over the next eight years. Outboard engines are mounted on an easily accessible position, that results in relatively more space than the counterparts. Moreover, advantages such as high reliability along with easy service abilities & maintenance will support the industry dominance. Inboard boats will witness approximately 4.5% CAGR owing to their high usage in fishing and other light weighted boats. North America, driven by U.S. recreational boating industry will account for highest volume share of over 50% by 2024. Well established marine industry along with rising number of boating participants in countries such as U.S. and Canada will primarily support the regional dominance. Moreover, presence of established industry participants across the region will further contribute towards the high revenue generation. Europe will grow significantly, exhibiting more than 5% CAGR over the next eight years owing to high production, resulting in increasing product exports. Moreover, availability of skilled and cost-effective labor force will propel the recreational boating market growth in the region. Ferretti, Brunswick, Sunseeker, MacGregor, Beneteau, Malibu Boats, American Sail Inc., Azimut Benetti, and Hunter are among the noticeable participants in the recreational boating market. Other prominent players include Hobie Cat Corporation, Princess Cruise, Catalina Yachts, and Bavaria Yachtbau. Mergers and acquisitions is among the key strategies implemented by the manufacturers to capture maximum recreational boating market share. For instance, in July 2016, Brunswick completed the acquisition of aluminum boat manufacturer, Thunder Jet to expand their product line and enhance their customer base.